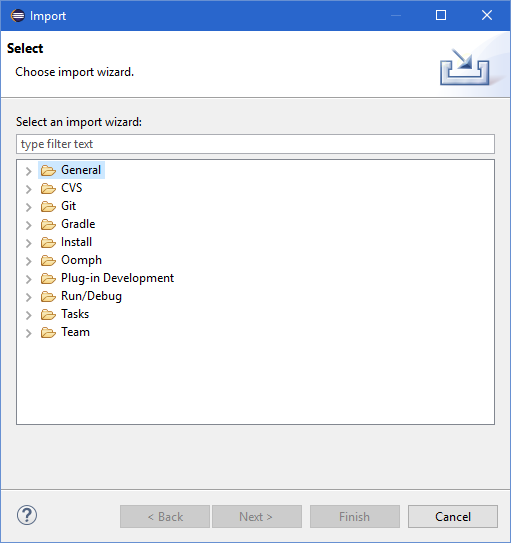 This wizard helps you import resources into the Workbench. When the Import wizard first comes up, you must choose what type of import to do. To assist in locating a particular wizard, the text field can be used to show only the wizards that match the entered text. If you choose this option, you will import files from an archive file. The file from which to import. Type in the full path or Browse to select the path on the file system. Dialog to select which file types to import. Use this to restrict the import to only certain file types. Import a project from a CVS Repository. 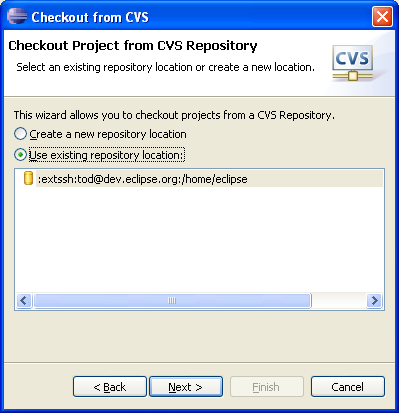 Go to the New CVS Repository Location wizard. Use a previously datafilled CVS location. Imports a project into this workspace that was previously located in this workspace, or that currently exists in another workspace. Root directory in the File System to start scanning for projects to import. Type in the full path or Browse to select the path on the file system. Archive file to scan for projects to import. Type in the full path or Browse to select the archive on the file system. Check all of the projects that were found for import. Rescan the selected source for projects to import. 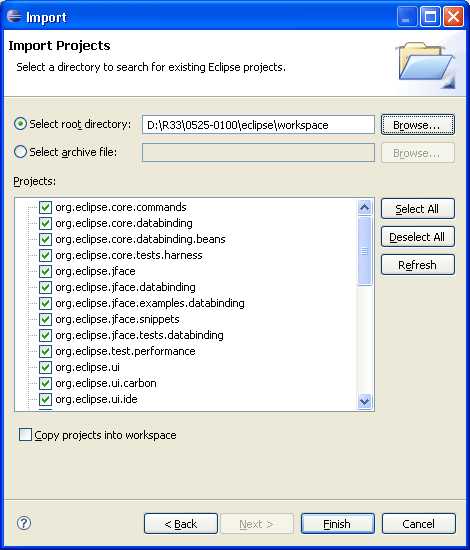 When selected this will cause the imorted project to be copied into the current workspace. If you choose this option, you will import files from the file system. The directory from which to import files. Select a previous path from the drop down combo or Browse to select the path in the file system. Check off all files and folders for import. Create hierarchy (folder) structure in the Workbench to accommodate the resources being imported, and all parent folders of those resources in the file system. 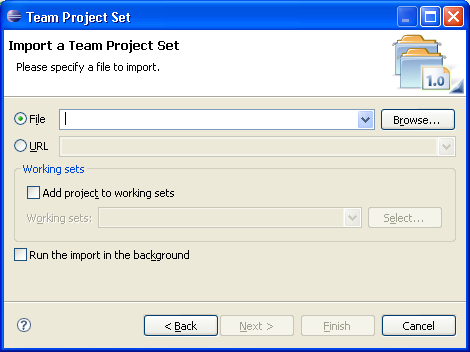 Create hierarchy (folder) structure in the Workbench to accommodate the resources being imported. 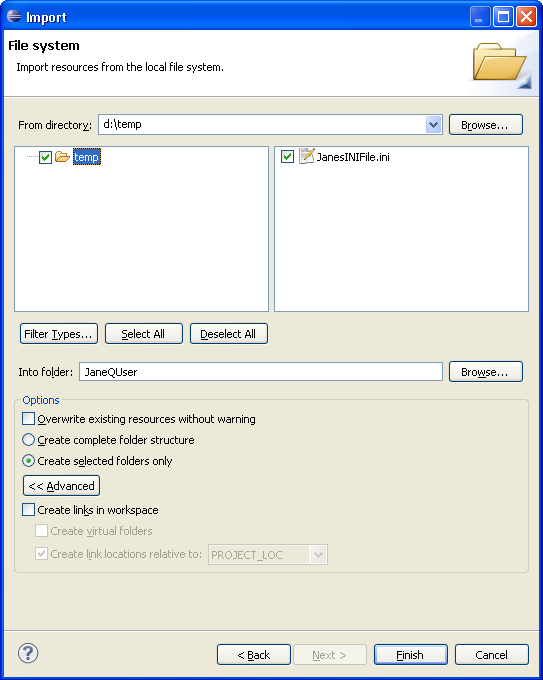 Create links to the original files and folders instead of copying them under the project folder. 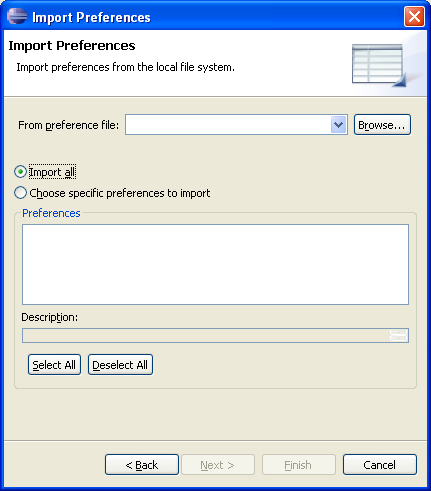 Import preferences from the local file system. The file from which to import preferences. Select a previous file from the drop down combo or Browse to select the file in the file system. Import all of the preferences. 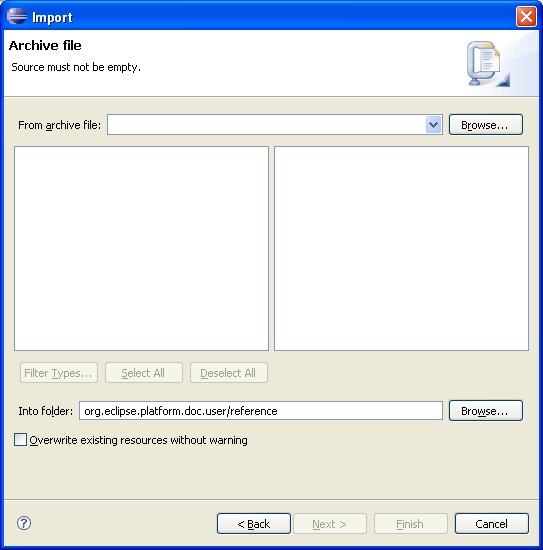 Choose from the preferences contained in the file, like CVS connection preferences or JRE preferences. Imports a description of the repository and version control information for a set of projects. This allows you to synchronize correctly with the appropriate project state in your repository.